It is important that you bond with your baby and take an equal role in parenting. The mother-baby breastfeeding relationship is unique and you can help mother and baby have a positive breastfeeding experience. 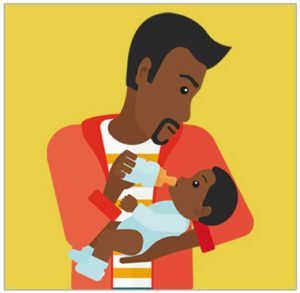 Breastfeeding has many health benefits for your baby and your partner. Your baby doesn’t need anything other than breastmilk for the first 6 months of life. It is recommended that breastfeeding is continued for up to 2 years alongside complimentary solid foods. Remember the more breastmilk the baby removes from the breast the more milk mothers make.